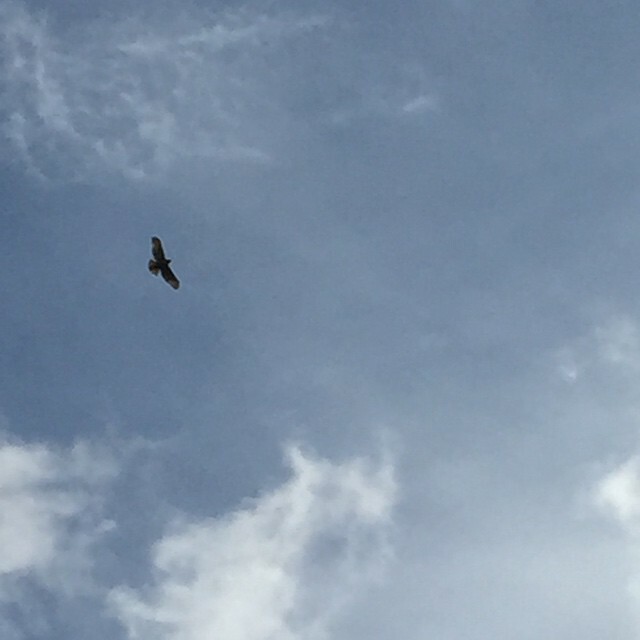 I was at the dog park the other day watching a hawk fly… so high and graceful when just gliding with the air current. But when he would slightly move out of it he would falter, fighting to fly as he was going against the flow. Then he’d correct, again soaring high above effortlessly. Right after seeing the hawk, I saw a hummingbird flitting about from here to there, stopping in the nearby trees adorned with the beady crimson berries. I thought, the hummingbird doesn’t tell the hawk how to fly, especially when delivering the message while both are flying. The butterfly nor the bee. How come so much of creation can exist harmoniously and yet humans cannot? I feel it’s the lack of being; being present, being in the moment, and being connected to oneself and to others. The hummingbird doesn’t know it’s a hummingbird, that’s our word, our label, it just is. Just as the hawk is, the bee is and the butterfly is; the only way they know how to be. I feel that moments like this come as silent insights guiding in this endless wake of today. How do you embody your beliefs? Can you exist harmoniously with the hawks, the hummingbirds, the butterflies and bees? As there is no Right of Way in flying. We try to paint a world of black and white, but it just isn’t so. One morning on our commute, my little one and I witnessed a hit and run. The odd thing about the accident was that it was caused, purposefully. One motorist was coming from the direction of a yield sign, the other motorist merging into the lane with the fellow not yielding… so they inched forward, finally hitting each other. Repeatedly. Because apparently once isn’t enough. Because both felt they had the “right of way”. In the depths of ones memory, the recesses of ones mind, as soul, we shine with no knowledge but knowing for we have all but forgotten this other half that silently speaks from the center of ones being. I am one of many but part of the Whole, connected as ONE in a matrix that knows no substance. The thing that makes us the same is we are all different expressions in physicality; the thing making us feel different is forgetting we are of the same spirit, same light, same love. Until the time we FEEL ones spirit, ones light, ones love; like waves washing up along the shore, the gentle embrace of the tide coming home, the recognition I am another you. “As you notice that a ray of light coming through a window is colored according to the shades of the different panes, so the divine ray shines differently in each creature” Bonaventure “Collations of the Six Days”. So many aspects of nature and life are allowed to flourish despite differences. There are a multitude of flowers each unique in color, scent and shape. And yet we want people to conform to our belief, our truth as we’re so moved by what it has done for us. We’re all a part of the same heavenly body, all with our sins and virtues, let’s embrace commonality and allow growth in the differences. You are a beautiful in your imperfection, you are loved beyond any human comparison and you are held at the bosom of this heavenly body we all call home. I know all about the ways of the heart—-how it wants to be alive.